You may not think of soccer being a sport where people get tooth injuries, but it happens. When players scramble for the ball, they can throw their arms up and their raised elbows can do significant damage to another player’s teeth or jaw! The types of injuries most commonly seen from a soccer or sports injury are a chipped tooth, loosened tooth, fractured tooth or knocked-out tooth. A hard blow to the jaw can also create problems with the mechanism or by damaging teeth. 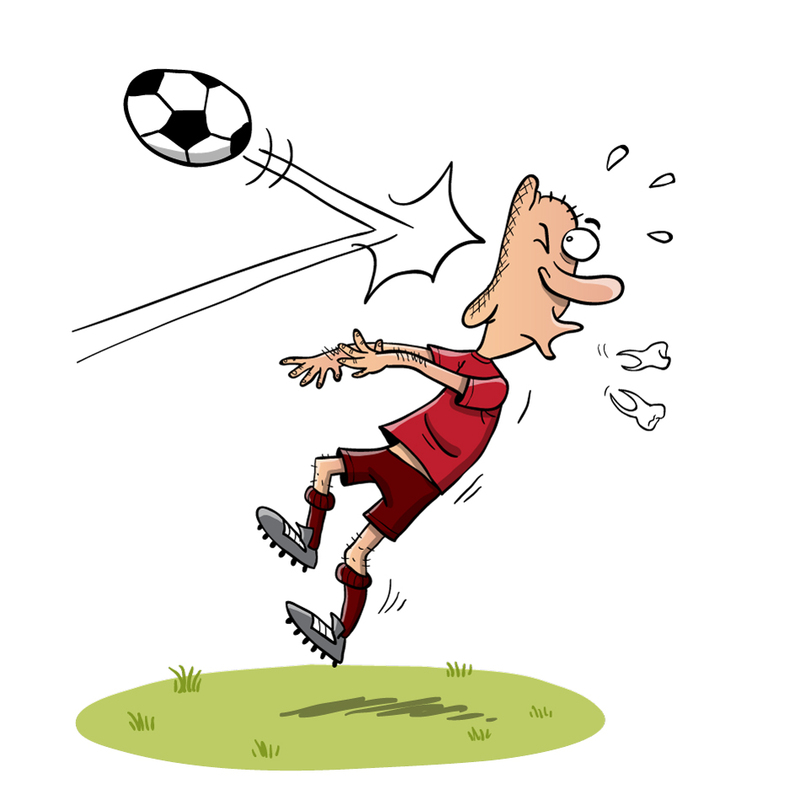 If a tooth becomes chipped during soccer play, it is not an emergency situation. Following the game, schedule an appointment with your dentist so they can assess the damage and recommend any necessary treatments. A chipped tooth may only be the obvious sign of tooth trauma; other unseen problems may also be apparent to your dentist, like a loosened or broken tooth. After examining a slightly-loosened tooth, your dentist may say that the injured tooth will tighten up over time, and recommend avoiding chewing on that side of the mouth for a period of time. If the tooth is very loose, this is a dental emergency and the sooner you see your dentist the better. There is a two-hour window for tooth survival. Try to avoid touching or moving the tooth, and avoid eating until you are able to be seen. Advanced Family Dentistry is available for emergency calls 24 hours a day. A tooth is considered fractured when a piece of it breaks off. It can break in an area surrounding a filling or on the cusp, or can split from the crown down to the root. Or the root itself can fracture. Unfortunately, tooth fractures, unlike bone, will not heal on their own. When a tooth fractures, the root can be exposed, which can render the tooth sensitive to hot and cold. It can also cause pain. You will want to see your dentist as soon as possible after the injury. Your dentist will need to assess the damage and prescribe a course of treatment that can include a filling, crown, root canal or removal of the tooth. If your tooth has been knocked out completely, find the tooth, but do not wipe it off if dirty. This will damage the membrane covering the root. If you need to rinse it off, use milk. Never use water. Place the tooth into your mouth back into the socket, or hold it between your teeth and gums as you go to the dentist. If you cannot to this, transport it in a glass of milk. Remember, you have a two-hour window for tooth viability. Your dentist will attempt to replace the tooth back into the socket if possible and eventually the body will reattach the root. If your dentist cannot replace it, they will recommend other options including a dental implant. Dr. Sonny Kim is a huge soccer fan and coach and both of his daughters have played on local soccer teams since they were five. Your kids might have been on a team that Dr. Kim coached! Being a local Reston-area dentist isn’t just about work; it’s about being a part of the community, and soccer is just one way Dr. Kim gives back. He continues to be active in the 50+ soccer league himself. If you or your child suffers a tooth injury while playing soccer – or any other sport – please contact Advanced Family Dentistry immediately. The faster we can assess the injury, the better your chances are of keeping the tooth. We’d love to be your family dentist and can provide ongoing dental health care for everyone in your family. Contact us to set your next dental appointment.